I don't think I have EVER consistently worked out on vacation. I might do 1 run or 1 workout, but seriously that is it. This time though, I am in the middle of my 1/2 marathon training, and I didn't feel that I could just blow off a week. By chance, the schedule was showing all light runs last week other than the long Sunday run, which just wasn't going to happen. Let's be honest. Overall though, I did pretty good with workouts. My biggest issue was that the gym had 1 treadmill. The limit was 30 minutes if it was between 7 & 9 AM, which of course is when it was! I had run on Friday before leaving, but Saturday was a bust, and Sunday we were in the middle of having our room switched. However, I did make it out Monday morning. Sadly, the treadmill was in use, so I had to do 12 minutes of elliptical before it was available. Did I ever mention I HATE the elliptical machine? I don't know what it is about that. I know it can be a good workout, but I feel trapped. Your feet are stuck in that little spot the whole time. Clearly, I have issues. I did get 30 minutes on the treadmill too. Tuesday was a similar situation, only I had to do 20 minutes on the recumbent bike (TORTURE!) first. As much as I hate the elliptical, I dislike a bike even more. I had the choice of recumbent or regular stationary at least! I don't know if I was too close or what, but when I stepped onto the treadmill, my knees were killing me. It didn't last though - WHEW! Finally on Wednesday and Saturday both, I got to do just the treadmill. Thurdsday, we snorkeled and hiked Dunns River Falls, so I am fairly certain they counted for crosstraining. I took Friday off. ﻿﻿ Food wasn't too much of a challenge since Jamaicans eat really well. It is the Americanized stuff that gets you - pastas, pizza, burgers, etc. I mostly stuck with the jerk pork/chicken, seafood, local fruits and veggies. I tried little bits of desserts, but nothing was fabulous enough that I wanted more. The downfall of the trip was ... adult beverages. What else would one expect at an all-inclusive though? I don't do the foo-foo stuff because the calories in mixers are out of this world. My tastes have changed drastically through the years and the sweet stuff doesn't really do it for me. There was Red Stripe Light on tap - if the tap and the keg actually matched. Hey, I am realistic, it MAY have been full calorie beer LOL. 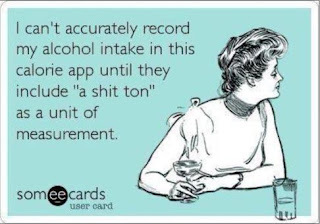 I tried to record my food in My Fitness Pal, but can't say I accurately tracked the beers. Let's just say I think I likely drank more beers than the miles I ran. But it was vacation, right?! Good news is that I am not really up from before we left. My last weigh in was January 9th because I forgot on January 16th, then was in JA for the 23rd. And Holla! Down 1.2 lbs today from the 9th. So maybe it really was Red Stripe Light! Never had Red stripe light! Is it any good? Great job on all you did during vacation. It certainly paid off.